Have you ever had a really great discussion on Facebook, Pinterest, or Google Plus that you wish you could bring into your blog? Are you looking for more followers on your social media stream because maybe you have a lot of followers in one place, but not another? It seems that social media sites are feeling your pain and are recognizing the growing importance of blogging and finding ways to help you cross pollinate. Embed your social conversations into your blogs. Facebook, Pinterest, and Google Plus now have “embed” features in posts. 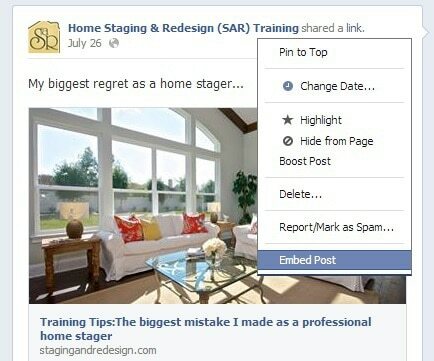 Embed posts from Facebook into your home staging blogs. So far Facebook posts seem to be the easiest ones to embed. Simply look for the drop down arrow in the upper right corner of the post you want to use and scroll down. Using Facebook posts can be a great way to share popular posts with your blog readers. It could also be a great way to get new followers from loyal readers who perhaps get your information from other sources. This post was one that I did a few weeks ago about my biggest regret as a home stager. It was actually very popular with 50 Facebook likes/shares and 33 Google Plus ones (according the counter on my website). I have to give credit here to Tom Scanlon with Houston Home Staging for the idea of embedding pinterest boards into home staging blogs. Simply change out the URL for your board’s URL. Using the Pinterest Widget Builder this is seriously easy. While embedding a pinterest board may be a little more difficult, it seems like a great way to make a statement on your blogs. You can also embed individual pins in the same way that you can Facebook posts. Click the box with the arrow (upper right corner of pin), scroll down to embed, and copy the code. This to me, is now the best way to do blogs that feature products or room designs. Copying the photo directly and putting it in your blogs posts can be considered copyright infringement whereas embedding the post is permitted as it shows all of the originating source of the photo. Help your target readers, whether homeowners or agents get additional information about their market or the real estate industry as a whole by showing what others are talking about, or bringing a great conversation from your page to your blog and newsletter readers. Embedding is easy, done the same way as Facebook and individual Pinterest posts, simply use the drop down arrow, highlight embed, and then copy and paste the embed code. What are ways that you’ll use the embed feature to cross pollinate your business? It’s funny because Tom Scanlon had only a few days ago posted in the Google Plus Home Staging Community about how he was using his Pinterest Boards in his blogs. I had been trying to figure out how to use this when Bill Gassett piped up about the new G+ feature. I had noticed the embed feature in Facebook about a week earlier, but hadn’t given it much thought. Today my head is swimming with ideas on how I’ll be using this in the future. How do you think you’ll use the new embed features from social media to improve your blogs or cross pollinate your readership? « Home Staging Tip: How to make a bed in a bag look like luxury.